Recent trading proved hugely dramatic for Apple with its stock tumbling nearly ten percent. Apple cut its forecast for its first fiscal quarter due to slowing economic growth in China and a drop in demand for iPhones. The situation did improve when Apple's share price was up by 4.3 percent but it did end the week down 5.1 percent. Thursday January 3rd was Apple's worst day trading since 2013. 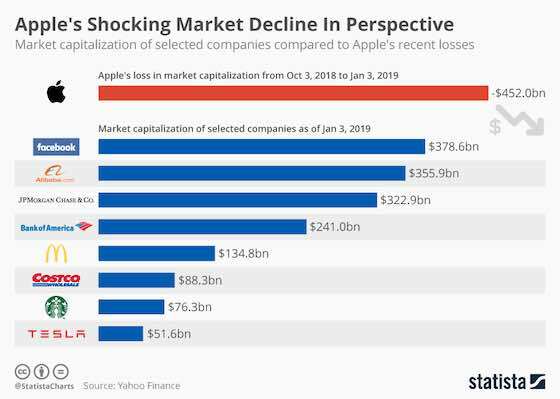 Apple common stock has lost just over $450 billion in market capitalization since October 3, 2018. Some analysts claim the slump is little more than a minor blip while others claimed it is a major disaster. Either way, the scale of the wipeout is colossal. As the following infographic shows, the $452 billion loss is higher than the market capitalization of Facebook and six times the size of Starbucks' market value. Apple beat Amazon to claim the title of the world's first trillion-dollar company after its shares reached $207.05. After the crash on Thursday, its market capitalization sank to $674 billion before recovering slightly to $703 billion with shares worth $142.19. There is an obvious lack of a game-changing product in Apple's pipeline and some observers have suggested it takes the unprecedented step of acquiring another company to improve its fortunes and satisfy investors. Given Apple's track record, however, such a move appears highly unlikely.